Since standardized tests vary between states, it’s difficult to explain specifically what each test is and its purpose; however, I can explain the role of different types of testing so that parents can ask their child’s teacher informed questions about each standardized test that their schools require. A standardized test is simply a test administered and scored in a standard way. Students should take the test under the same conditions and graded with the same guideline. This allows for adequate comparison. 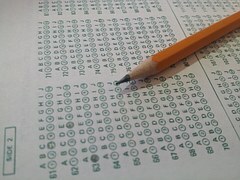 High-stakes testing is a term that is often used with standardized tests. This means that there is some sort of consequence associated with the test. For example, a high school graduation test is a high-stakes test because students cannot graduate high school without passing that test. Most students take tests that could be considered high-stakes. Any test that stems from the No Child Left Behind Act and measures adequate yearly progress (AYP) is a high-stakes test because the schools will bear the consequences. Norm-referenced tests are test that compare individual students’ scores and rank them. Norm-referenced tests are usually scored as percentiles because they tell a parent how well a student did in comparison to other students. Students who ranked in the 90th percentile did better than 90% of the students who took the test. Imagine a bell curve—most students will fall in the middle of that curve, the high-achievers and the low-achievers will be the outliers. Norm-referenced tests are often used to place students in gifted or enrichment programs. If a student proves that he or she performs in a high percentile in a certain subject (this percentile is determined by the school or district), then he or she is placed in a program to cultivate those skills at a higher level than the norm. The SAT is a norm-referenced test. It ranks students on their score rather than their performance on each individual task. Criterion-referenced tests are made to follow a certain criteria. Usually these tests follow the state’s standards, so they are often called standards-based tests. These tests test students on specific knowledge or skills that they should have already learned. They help determine whether a student has learned enough of the material to “pass” the test; a passing score isn’t necessary 50-60%, but a number that is determined by a committee who is familiar with the test and standards. Two popular examples of criterion-referenced tests are the Partnership for Assessments of Readiness for College and Careers (PARCC) and Smarter Balanced Assessment Consortium (SBAC). These tests reflect the Common Core Standards and are used throughout the United States in order to test student achievement and knowledge of their current grade level (i.e. the PARCC test would test a 3rd grade student in the Spring using the 3rd grade Common Core Standards). As always, if parents are concerned or interested in learning more about the specific standardized tests in their school, I suggest that they talk to their child’s teacher. A teacher would be able to explain the specifics of each standardized test. Below is a list of questions to ask a teacher. 1) What tests will be administered during the school year and when? 2) What are the purposes of these tests? Are they norm-referenced or criterion-referenced? 3) Besides a standardized test, what are the other evaluations methods you use to measure a child’s performance and ability? What do avenues do you use to determine which students enter the gifted and enrichment programs? 4) How can I help prepare my child for the tests at home? What are you doing in class to prepare for each test? Besides talking to a teacher, parents can enroll their students in programs that specifically help students prepare for standardized tests. These programs will walk students through what these tests look like as well as provide them with tips and tricks to help them tackle the test with ease. It’s important that parents learn which tests their children are specifically taking and when. The more parents know, the more they can assist their children and understand their children’s progress. What other questions do you have about standardized tests? What test do your children take in your state?